Our blogger in residence, Mary of TrendFEM came along to watch Akademi at Bell Square recently. We were very excited to host her as we knew she would not be disappointed by the whole experience. As we walked up to the empty square, we could see a large circle drawn in chalk, very intriguing! If you haven't visited Bell Square before you may have walked through it on a 'normal' day - there's a pub, a fish shop, a restaurant and a bookies. When Bell Square is set up for a performance day, the area is transformed with pop up wooden tiered seating in the round. This creates a horse shoe shape as each end of the semi circle meets the stone benches. There's a gazebo for the production team who are always on site and managing the sound system and helping the performers get set up. You can see how it looks below - it's quite something to see an empty space transformed into something extraordinary - we often have crowds of one thousand or more turning up to watch and enjoy contemporary outdoor arts for free. 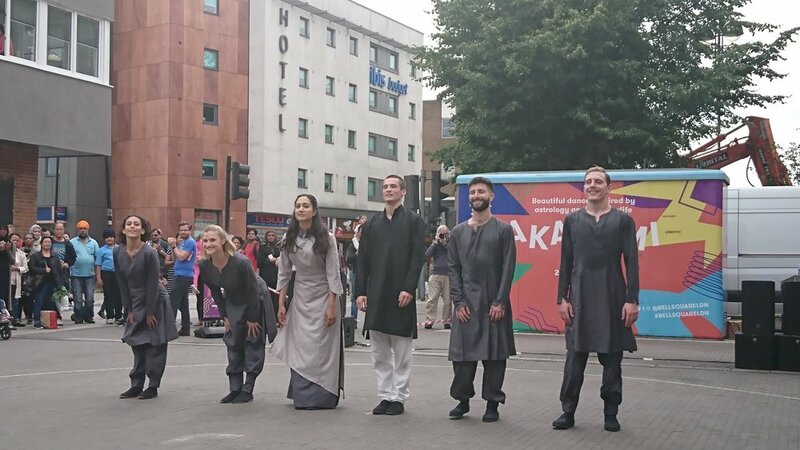 Akademi tantalised Hounslow’s local community last Saturday with their multifaceted exploration of Dante’s Paradiso: Man’s Enduring Search for Perfection at Bell Square London, a free festival packed with dance and physical theatre performances. Paradiso is a poignant and highly moving piece of choreography. Following the inspirational conceptualisation of Akademi’s director Mira Kaushik OBE and choreographer Jose Agudo, Akademi instills Dante’s final stage of his narrative poem, written in1308-1321, The Divine Comedy, through a wide-range of contemporary and traditional Indian dance styles. For 40 years, Akademi has continued with their mission to inspire and bring ‘classical, contemporary, popular and participatory South Asian dance’ to all audiences. Their mission, to inspire, is crystal clear throughout Paradiso. In his literary masterpiece, Dante describes the struggles and obstacles man faces in a lifetime. Akademi expresses these cosmological and mortal forces through the strength of six diverse dancers, some more experienced in Indian dance and others trained in contemporary dance technique. You can read the rest of her Bell Square London review on TrendFEM. Newer PostNew for 2017: Bell Square Volunteers - do you want to take part?